I had never killed an animal in my life. Until today. At noon I was standing on a family farm in Temecula, California holding a live chicken in my arms. By 5 p.m. I was standing in my kitchen dunking a fresh whole chicken into a brown sugar brine solution to get it ready to slow roast. The process in between was both exciting and disconcerting – a true life lesson in what it really means to be a meat eater. Fair warning: this post and the photos below are graphic. But they are also really important for me to share as part of my journey to healing through the GAPS Diet and beyond. Because after all, fully coming to terms with a diet centered around drinking broth made from animal bones brings me, as a former vegetarian of more than 10 years, smack in the face with a moral dilemma. On one hand, I feel the best I’ve felt in years (my whole adult life really) while following the Paleo/GAPS Diet over the past two months. I’ve eaten more animal products during this time period than in the first 20 years of my life combined – bone broth, bone marrow stew, organs, boiled meat, and lard. On the other hand, I became a vegetarian at age seven because I thought it was inhumane to kill and eat animals. With the exception of some fish and poultry on special occasions, I remained vegetarian until I studied abroad at age 20. Because let’s face it, who could fully immerse in Spanish culture for a semester without indulging in the glory that is Jamón Ibérico? I’d since gotten away from being so concerned with animal rights in exchange for being a foodie.That was, until I connected last fall with some experts in ancestral health. They introduced me to the Paleo/ancestral health movement and encouraged me to actually pick up and read Michael Pollan’s The Omnivore’s Dilemma, which had been sitting on my bookshelf collecting dust since my early 20’s. I became quickly engrossed in sourcing of meats, eggs and raw dairy – pastured, grassfed, hormone-free, free-range, humanely raised, sustainable – first for the personal health benefits, then for the environmental/social impact. I felt good about my better-informed and more humane meat-eating, and for over a year, I didn’t experience any mental anguish eating animal products. However, in the past two months as I’ve become even more mindful in my eating, I have been thinking once again in stronger alignment with the moral dilemma of my youth. If I am not willing to kill an animal (even squashing spiders makes me feel pains of remorse), then how can I feel okay eating one? Eating meat is inherently primal in nature. It brings up notions of the aggressive male hunter going out into the forest to flex his ego by bringing home the largest buck as a demonstration of his dominance over nature. And yet, the venison he cured would sustain and nourish his family throughout the cold winter months of scarce food. I am beginning to wonder if humans, as we evolve further from our primitive roots to a more enlightened (and physically light) reality, if we will also evolve to require less meat for proper nutrition and optimum health. Perhaps Ghandi and his followers, with their enlightened vegetarian ways, were on to something. Americans’ separation from our food sources is one of the biggest problems with our current food system. We go to the grocery story and mindlessly pick up a plastic package of sterilized, hormone-packed chicken breasts that are about as far from a live chicken as you can get while still eating “chicken.” I bet that the majority of Americans, if they saw firsthand how a live chicken becomes a nugget, they would think twice about their next trip through the drive through. If I am going to eat meat, I want to be as close to the source as possible. It’s irresponsible for me, as a meat eater, to not fully understand what it takes to bring meat to my table. 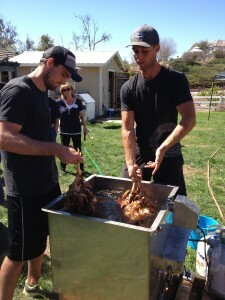 So when Primal Pastures sent out an invitation to attend a Chicken Processing Workshop, I jumped on the opportunity. Actually, I debated for about a month before committing to attending for fear that my blissfully unaware meat-eating world might come crashing down. I arrived at Primal Pastures today with mixed emotions. I was proud of myself for taking the leap in becoming even more informed in my choice to eat meat, and also incredibly nervous for the experience of killing an animal for the first time. The process itself was pretty straightforward, and Farmers Paul and Rob did an excellent job explaining both the how to and the why of each step along the way. Step 1: Pick up a chicken off the pasture. The chickens we could select were two-year-old laying hens, past their prime in egg production. These hens had spent their entire lives grazing the pastures, scratching up bugs like all healthy, happy chickens do. I wasn’t sure how to approach picking up a chicken that I knew I was going to kill, so I just walked out into the pasture and stood there calmly. A chicken walked over to me and stopped in front of me. This was the moment of truth. I picked her up without any struggle, and off we went to the killing station. Step 2: Kill the chicken. Farmer Paul and his team explained that their killing cones are one of the most humane kill methods around. The chickens are being killed less than 20 yards from where they graze, so they experience minimal stress prior to the end of their lives. And the cones themselves allow for the chickens to be placed upside-down during the process, which puts them in a relaxed (similar to playing dead) state. Awaiting the kill was one of the most difficult parts in the process for me. Because they only had four killing cones, I spent about 10 minutes prior to killing my bird waiting my turn while holding her feet up in my arms. I began feeling really nervous but tried to keep myself calm to minimize the stress on her as well. She got a little flustered at one point and gave me a nice scratch with her sharp feet, but otherwise we were both just together in that space trying to keep calm. I felt a bond with my bird doing those minutes – I could feel her warmth and her breath. I tried not to think about what I was going to do next. When the time came, I placed my bird feet up in the metal cone and pulled her neck through the smaller hole in the bottom. Cradling her beak and head in my fingers, I took a deep slice to her carotid artery and watched as her deep red blood spilled out over my hand and onto the ground. The farmers told us that the lack of blood to the brain makes the bird go into a coma almost immediately, but it was hard to believe as my bird’s body flapped around for a few seconds in the cone. Apparently the nerves in the brain are still firing at this point so the bird is having involuntary spasms. They don’t use the expression “a chicken with it’s head cut off” for nothing. Eventually my bird stopped moving and it was done. Step 3: Scald the bird. This part of the process was pretty straightforward. We dipped our birds in a hot water bath to loosen the feathers. The most notable thing about this step for me was how heavy the dead weight of the bird felt as I carried her by her feet to the scalding bath. After about a minute of scalding, the feathers were coming out easily. Step 4: Pluck the bird. Primal Pastures had a neat machine that looked like a big metal washing machine drum with 30+ short rubber dowels attached. When you turned the machine on, it would shake and the birds would bounce around off the rubber dowels until the feathers come loose. We put our birds in the bottom of the drum, turned on the machine, and sprayed them down with a hose as their feathers came loose to keep the feathers from flying. After about a minute, our birds were completely naked. It was surprising to see just how small the birds were without their protective coats. For me, this was the step that transformed the bird from an animal into a potential food source. Step 5: Trim and gut the bird. Besides awaiting the kill, this was the worst part of the process. After completing the first series of trimming cuts (removing feet, head, oil gland and loosening the crop), I had to reach my entire hand inside the bird’s carcass to remove its innards. The bird was still warm to the touch inside. I was not prepared for this. My heart sank. Just fifteen minutes prior, that same bird was walking on the beautiful pasture. But the deed was done. All I could do was finish cleaning my bird and package up the organs and feet for making broth. Step 6: Chill the bird. Plain and simple. We placed our birds in an ice bath for 5 minutes to cool them down. Step 7: Bag and shrink wrap. The final step on the farm was to place the bird in a shrink wrap bag and dip it quickly in hot water to seal. Once I had my Primal Pastures sticker placed neatly on the package, my bird was ready for main-stream consumption. I felt a sent a pride in my work, and also a sense of grief. The supportive community of like-minded people who attended made everything feel a little less barbaric. Maybe it’s the whole group think mentality. We were all in it together. The knowledge of the farmers and their commitment to humane practices in the raising and killing of their birds made me feel a little better. I took comfort knowing that we were killing animals in the most humane way possible (and yes, that absolutely sounds like an oxymoron to me). The excitement of being so close to my food source and doing manual labor on a farm. Hot sun on my face, sweat, the sweet smell of grass and manure. The happy animals grazing in their pens. This is how all meat should be sourced. Dare I say fun? I have to admit that I enjoyed learning something new. I felt a sense of adventure and a rush of adrenaline as I prepared for the kill. Holding a live chicken in my arms, waiting for our turn to use the killing cones. Trying to keep myself calm to in turn share that feeling to an animal facing a death sentence. Grabbing my chicken by the neck and having my hand covered with her blood as I severed her artery, then seeing my chicken’s body shutter and shake from her reflexes as her blood slowly drained. Feeling the weight of a freshly killed animal as I carried it by it’s feet to the scalder. Reaching inside its carcass to clean out its guts and still feeling the warmth of recent life. The creepy/sad feeling of driving home from the farm with a dead animal in the car seat next to me, perfectly wrapped up in a shrink-wrapped bag. This is what it takes to eat an animal in the most sustainable way possible. And even with the attention to treating the animal with dignity and respect throughout its life to its death and my meal, I’m not sure it’s worth it. What did the chicken feel as it died at my hands? Is the life of a sentient being worth the flavor of good meat? Is my health worth it? Who am I to say that I deserve to live a healthy life over the life of a chicken? These are questions without easy answers. What I can say is that it is not possible to mindlessly eat an animal that I killed myself. I don’t think I’ve ever put more care into preparing a meal than I did to cook my bird. The brining, the roasting, the carving, the slowly chewing, the savoring of each bite (it was chewy, dense and sweet - like no poultry I’ve ever tasted before) – I completed each step with an overwhelming sense of gratitude and love. Did I feel nauseous thinking about eating my bird? Absolutely. Did my bird taste fresher than any other meat I’ve ever eaten? No doubt. Do I think that my small and delicious meal was worth the life of an animal? I’m not sure. What I can say with confidence is that I have a whole new reverence for the process of bringing meat to my plate. I also have a lot of unanswered questions and feelings of remorse that will take some time to process fully. Regardless, if any of you meat eaters ever get the chance to be this close to your meat sourcing, I strongly recommend you do it. It is no longer appropriate for any of us to be uninformed consumers. Our knowledge and our ability to vote with our dollars are the best tools we have to start fixing a food system that is destroying our environment and making so many of us chronically ill.
Also, a big thanks to everyone at Primal Pastures for the opportunity. You have changed me and I am grateful.